Children at two Swansea primary schools are benefiting from an innovative learning programme, that will help develop entrepreneurialism and problem-solving skills for future success. The Bumbles of Honeywood, designed by teachers and enterprise experts takes children to the world of Honeywood, where they learn about the environmental plight of the honeybee and the challenges the community of Honeywood face during their daily adventures. Through a series of visually engaging illustrations, books and a range of interactive educational activities including video, children aged five and six learn skills that encourage enterprising mindsets, preparing them for future life challenges, problem solving, and teamwork. One of the lead characters in the video version of the books is Grandma Bumble brilliantly performed by entertainer, presenter and pantomime dame, Kevin Johns. All materials are available in both English and Welsh. They explore the mind-set of enterprise and the skills associated with being entrepreneurial, skills which are not traditionally introduced to younger pupils in schools. The objective for 2B Enterprising, the company who designed the programme was to create classroom ready content and activities that engage and encourage children using contextual based learning. 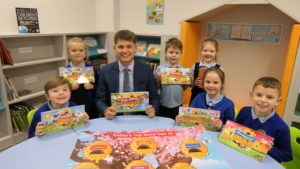 Schools need funding for the programme and chartered accountants, Bevan Buckland LLP, is the first business to formally sign up to a new Corporate Engagement Partnership and their support will enable Sketty Primary School and Cwmrhydyceirw Primary School to take part in the initiative. “We are delighted to sponsor the Bumbles of Honeywood programme. As a business we are passionate about education and the development of people’s potential within our community. Over the last three years we invested in The Young Business Dragons initiative helping young people in the community to develop entrepreneurial skills. We believe this latest programme will inspire the younger age bracket of entrepreneurs” said Lewis Turner, Marketing Executive of Bevan Buckland LLP. “Having delivered enterprise training initiatives in Swansea over many years, I am thrilled that local businesses are signing up to the new Corporate Engagement Partnership. As well as the funding, their commitment to support the young learners will ensure the scheme delivers lasting benefits for the children,” said Sue Poole, CEO of 2B Enterprising.